1. 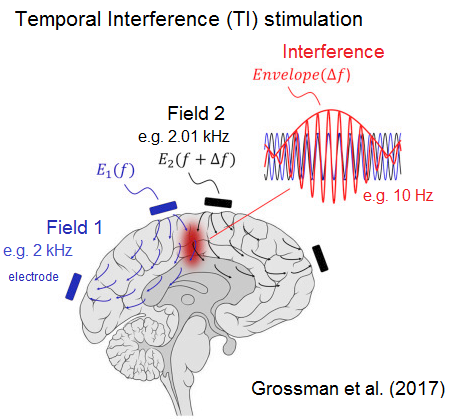 Noninvasive Deep Brain Stimulation via Temporally Interfering Electric Fields by Nir Grossman, David Bono, Nina Dedic, Suhasa B. Kodandaramaiah, Andrii Rudenko, Ho-Jun Suk, Antonino M. Cassara, Esra Neufeld, Niels Kuster, Li-Huei Tsai, Alvaro Pascual-Leone, Edward S. Boyden. Cell. Temporal Interference allows selective, non-invasive, deep-brain stimulation in mouse hippocampus without stimulating the cerebral cortex! Read more here & here. 2. Dorsal-CA1 Hippocampal Neuronal Ensembles Encode Nicotine-Reward Contextual Associations by Li Xia, Stephanie K. Nygard, Gabe G. Sobczak, Nicholas J. Hourguettes, Michael R. Bruchas. Cell Reports. This study links hippocampal CA1 activity to nicotine-seeking behavior, showing a circuit mechanism for a complex behavior related to addiction. Read more here & here. 3. Dorsal Raphe Dopamine Neurons Modulate Arousal and Promote Wakefulness by Salient Stimuli by Jounhong Ryan Cho, Jennifer B. Treweek, J. Elliott Robinson, Cheng Xiao, Lindsay R. Bremner, Alon Greenbaum, Viviana Gradinaru. Neuron. How do we override the natural drive to sleep? Dopamine neurons called dorsal raphe nucleus neurons are key in the face of salient stimuli. Read more here & here. 4. 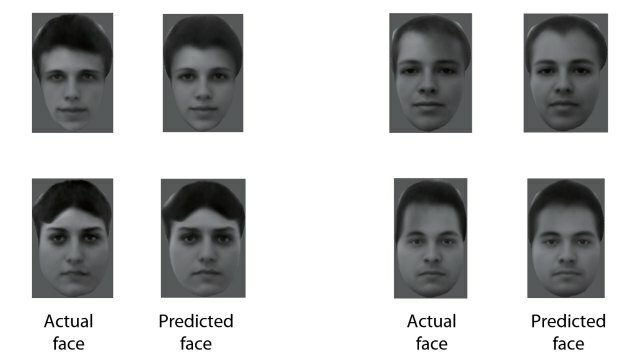 The Code for Facial Identity in the Primate Brain by Le Chang, Doris Y. Tsao. Cell. Using the responses from about 200 neurons, a simple code can be used to reconstruct faces and predict the responses of the neurons to a face using this code. Read more here & here. 5. Visuomotor Coupling Shapes the Functional Development of Mouse Visual Cortex by Alexander Attinger, Bo Wang, Georg B. Keller. Cell. 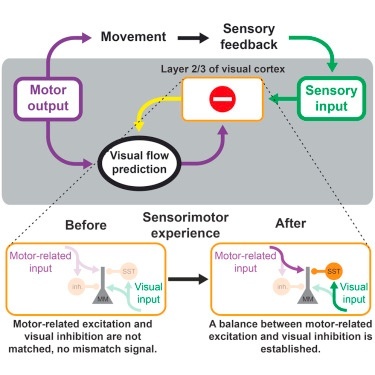 They identify neural circuits in the visual cortex for integrating sensory and motor experiences and show that perception and visually guided behavior are shaped by predictions of visual feedback during locomotion. Read more here & here. 6. Activation of cortical somatostatin interneurons prevents the development of neuropathic pain by Joseph Cichon, Thomas J J Blanck, Wen-Biao Gan & Guang Yang. Nature Neuroscience. 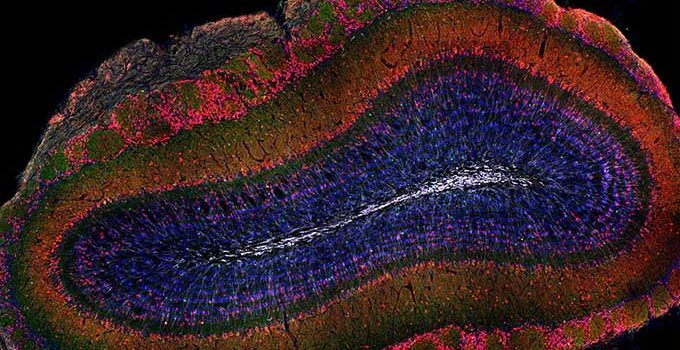 Several types of interneurons in the cortex precisely regulate and control pain signals. This study provides the first direct evidence that impaired Somatostatin cell activity is involved in the development of neuropathic pain. Read more here & here. 7. 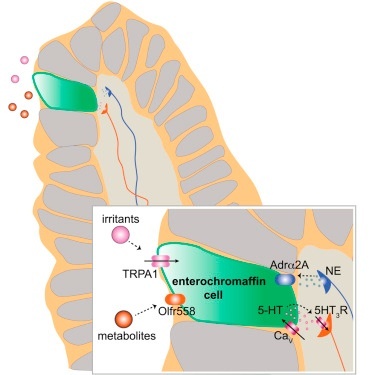 Enterochromaffin Cells Are Gut Chemosensors that Couple to Sensory Neural Pathways by Nicholas W. Bellono, James R. Bayrer, Duncan B. Leitch, Joel Castro, Chuchu Zhang, Tracey A. O’Donnell, Stuart M. Brierley, Holly A. Ingraham, David Julius. Cell. Enterochromaffin cells of the gut modulate sensory nerves via serotonin receptors and synaptic connections. Read more here & here. 8. Selective Optogenetic Control of Purkinje Cells in Monkey Cerebellum by Yasmine El-Shamayleh, Yoshiko Kojima, Robijanto Soetedjo, Gregory D. Horwitz. Neuron. Channelrhodopsin-2 was taken up exclusively by targeted Purkinje cells, and when stimulated, affected the animals' motor control. This makes studying the complex role of Purkinje cells much more tractable. Read more here & here. 9. A Labeled-Line Neural Circuit for Pheromone-Mediated Sexual Behaviors in Mice by Kentaro K. Ishii, Takuya Osakada, Hiromi Mori, Nobuhiko Miyasaka, Yoshihiro Yoshihara, Kazunari Miyamichi, Kazushige Touhara. Neuron. Identifies distinct neural circuits that mediate how male pheromones in mice enhance sexual behaviors in females, and potentially aggression in males. Read more here & here. 10. Engineered AAVs for efficient noninvasive gene delivery to the central and peripheral nervous systems by Ken Y Chan, Min J Jang, Bryan B Yoo, Alon Greenbaum, Namita Ravi, Wei-Li Wu, Luis Sánchez-Guardado, Carlos Lois, Sarkis K Mazmanian, Benjamin E Deverman & Viviana Gradinaru. Nature Neuroscience. 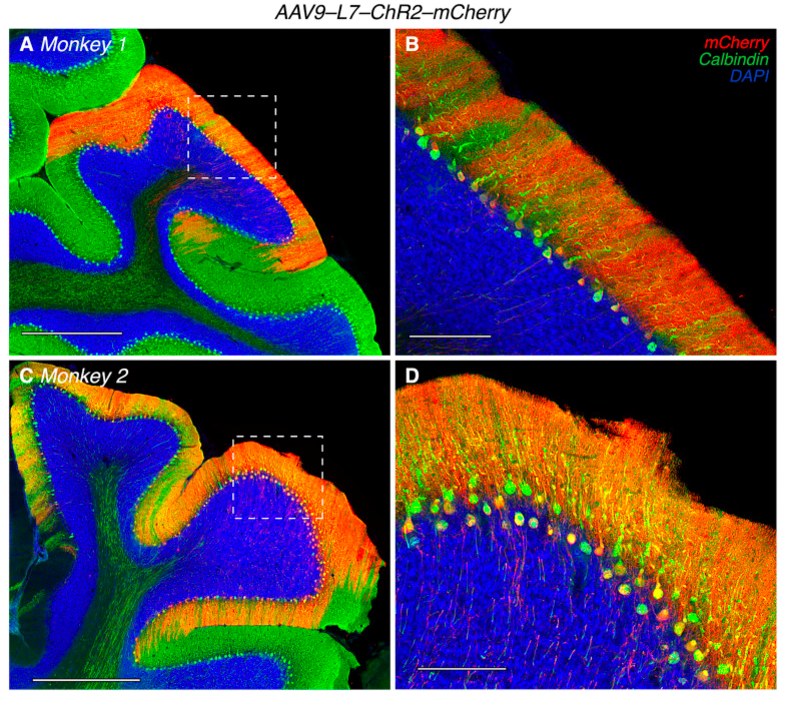 They developed two new variants of a vector based on an adeno-associated virus (AAV). One crosses the blood brain barrier, carrying cargo to the central nervous system. Another delivers genes to the peripheral nervous system. 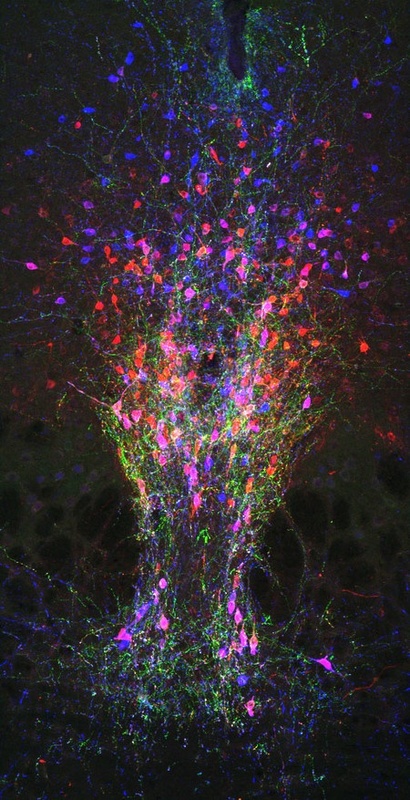 The vectors are customizable and can be used to help map neural circuits in health and disease. Read more here & here. 11. Hypothalamic regulation of regionally distinct adult neural stem cells and neurogenesis by Alex Paul, Zayna Chaker, Fiona Doetsch. Science. 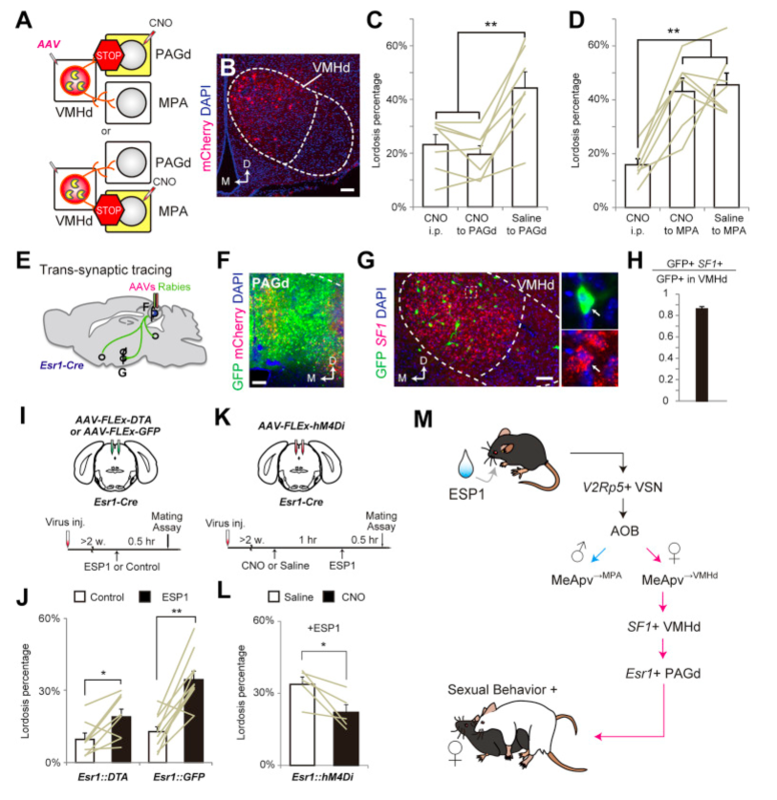 A neural circuit for on-demand control of neurogenesis in subventricular zone and olfactory bulb when hungry or sated suggesting neural circuits from diverse brain regions can regulate different pools of stem cells in response to stimuli and states. Read more here & here.